The Spirit Sanctuary always needs financial support to help us help homeless animals. The animals receive quality food, shelter, and medical attention  needs met from private donations. Donations go toward the cost of food, board, veterinary bills, leashes, collars, training crates, etc. Help us continue to help these rescued animals. 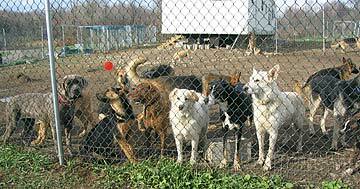 We welcome and appreciate corporate and individual sponsorships of our facility, dog supplies, and other needs. Naming rights are available for barns and buildings. Corporate sponsors are vital for the maintenance of our facility. Please contact us for further info. Sponsor bringing electricity to our new main building, fencing, as well as other projects. For $35.00 per month, you can help house, feed, and care for a homeless animal. Choose a dog, and donate online. For a $40.00 donation, you can honor your cherished friend by posting their memorial on our Web site. What better way to memorialize your treasured friend than your donation to help to save another animal's life! Email Us us your tribute in the body of the email, and attach the photo of your pet. Once we determine that we can retrieve your information, we will confirm the memorial by email. Then you can make your $40 donation online: use your credit card, or send us a check by mail. All Of This Takes Money, and We Need Your Help!